One way to add a bit of visual interest to your tank is to include an air stone with the rest of your tank accessories. Air stones serve two different purposes in an aquarium. For one thing, they create a stream of bubbles that’s in constant motion. But did you know this motion also has a lot of great benefits for an aquarium? By using the best aquarium air stones, you can make sure your aquarium looks its best and stays as healthy as possible. 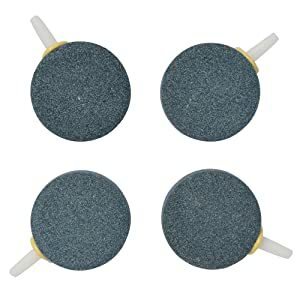 What is the Best Aquarium Air Stone? Where to Place Air Stone in Aquarium? How to Install an Aquarium Air Stone? How to Clean Aquarium Air Stone? One of the main reasons to put an air stone in an aquarium is if the water doesn’t have a lot of movement. If you look at the surface of the water and it remains mostly undisturbed, it’s likely that the water isn’t being circulated enough. Air stones do not directly put oxygen into the water. What they do is increase the surface area so that the more of the water comes in contact with the air at the top of the tank. This allows a greater volume of water to release carbon dioxide and take in oxygen. The biggest benefit of an air stone is how much it improves the circulation of an aquarium. 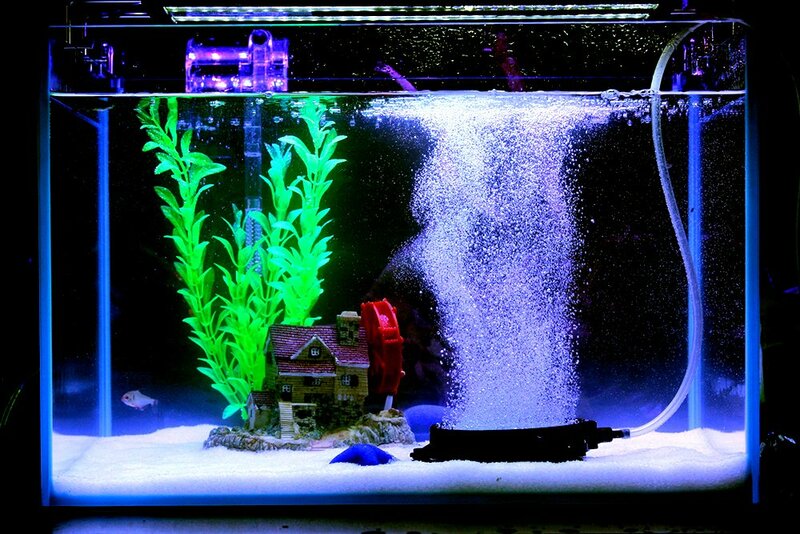 The bubbles are especially effective at lifting the water near the substrate to the top of the tank. This is important because this water often doesn’t always get circulated as much as it should. Even if you have a good filter, an air stone can help circulate the water more effectively to make sure as much gets to the filter as possible. If you’re thinking about investing in an air stone, have a look at our reviews. We found five of the best air stones available to help you make the right choice for your aquarium. These cylindrical air stones are made by a company called Pawfly, one of the top brands in Europe and North America. They take a lot of care in making these stones, using only high quality, non-toxic materials. Because they use such a high temperature when sintering, these stones are really durable and dissolve oxygen at a high rate. Plus, they put out a lot of tiny bubbles instead of a small amount of large ones which most fish and plants prefer. Eco-friendly epoxy resin is used to attach them to the holder and they’re individually packaged to keep them intact. They’re great for fish aquariums as well as hydroponics. 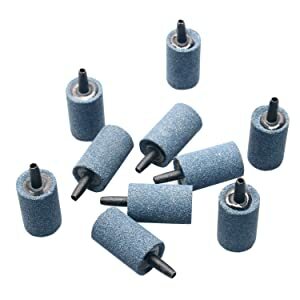 These stones need a jet volume of 1.3L per minute and are recommended for use with a 2 to 4W air pump. You can easily clean them when they start putting out fewer bubbles and replace them as needed. You’ll have plenty of backups as they come in a pack of 10. Yueton makes these cylinder-shaped air stones that add a lot of beauty to your tank. Both the mineral and the plastic center are bright blue and add a nice pop of color to your tank. The bubbles are a little larger than some other air stones but still a nice size that won’t overwhelm your fish or your tank. They’re slightly bigger than 1 ½ inches long and fit into a 4mm soft tube. This is another great option from Pawfly that’s made with the same care they use to make all of their products. The only use high-quality, non-toxic materials and are really durable. They’re round and flat which gives them a wider surface area which is perfect to create an impressive stream of bubbles. They need 2L per minute of jetting volume and a 2 to 5W pump for the best results. You can clean them regularly and you’ll be able to use them for a long time. This set of 4 will last you a decent amount of time. If you’re looking for a wide stream of bubbles, this disc-shaped air stone from AquaticHI will do the trick. The high-quality materials create small, tiny bubbles that not only increase oxygenation, it also adds a lot of movement and interest to your tank. Because it’s 4 ¼ inches wide, it’s able to create a wider bubble stream. Three suction cups are included to hold the stone in place which helps decrease friction and abrasion so it will last a little bit longer. It’s recommended for air pumps of greater than 4W and fits inside 3/16 inch tubing. This is another awesome choice from Pawfly that puts out an impressive amount of bubbles. The unique dome shape is 4 inches across and puts out an impressive display of small bubbles. It has the same exceptional Pawfly materials and craftsmanship plus it puts out uniform sized bubbles that look great in any tank. For this air stone, you’ll need an air pump of more than 4W and 20L per minute of jet power. All of Pawfly’s products are great but we think that their cylinder bubble diffuser air stones are particularly good. Pawfly takes a lot of time manufacturing these air stones and uses only high-quality, non-toxic materials so you don’t have to worry about whether or not they’re safe for your tank. These stones are really durable and dissolve oxygen at a high rate so you get tons of little bubbles. When they start to slow down, it’s easy to give them a good cleaning. Plus, when it does come time to replace them, you’ll have plenty available since they come in a pack of 10. Air stones should be placed in the bottom of the tank but there are some other things to consider. First, make sure to place it some distance from the filter. 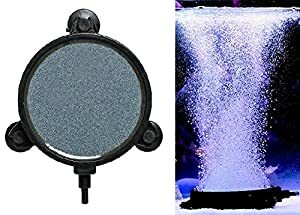 If the bubbles produced by the air stone go directly into the filter, they won’t have as big an effect on the water. Worse, they could ruin your filter. It’s a good idea to place the air stone among plants and other decorations in your tank so the bubbles don’t interfere with any open areas where your fish swim. If you place your air stone and notice that the fish avoid that area of the tank or hide, try moving it to a more secluded part of the aquarium. Placing it behind plants is one thing to try that might help keep the bubbles from the area where you fish like to swim. You can also install air stones underneath gravel substrate. 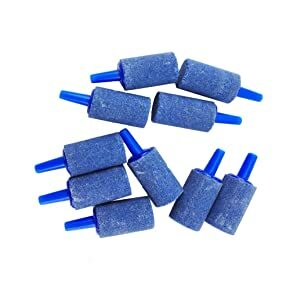 This is a great way to get them out of the way and have a little more control over the bubble flow, especially if it seems to bother your fish when above the gravel. Installing an air stone is easy but before you can begin, make sure you soak it in water for at least an hour. 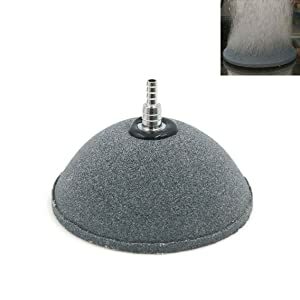 That will help eliminate any dust particles and get the stone thoroughly saturated before placing it in the aquarium. There are a few other things that you need, too. First, you have to have an air pump. Make sure that you use one that is the right size for your air stone. Generally, you’ll need one that’s 2 to 5W but that varies on the size of your aquarium and the air stone you choose. You’ll also need a few feet of flexible airline tubing, a one-way valve, and a regular valve. To set up the air pump, attach one end of the flexible hose to the pump outlet. Leave about an inch of length and splice in the regular valve. It acts as a bleed valve which will come in handy later when you can use this valve to make adjustments to the flow rate into the air stone. Next, move down the tubing about 2 inches and splice in the one way valve. This will prevent the water from backing up into the tube if there’s ever a power cut. Place the air stone at the end of the tubing and place it into the aquarium. Plug in the pump, making sure it’s placed so it doesn’t come in contact with any water. To clean an air stone, the first thing you have to do is take it out of the aquarium and remove it from the air hose. Take off any rubber pieces on the end to make sure that the water can penetrate the whole stone while you clean. Max a mixture of water and bleach. It’s very, very important to use a minimal amount of bleach. A 10:1 mixture is a good amount. The easiest way to do this is to mix it in a large measuring cup. Make sure it’s high enough to completely cover the stone you want to clean. Soak the stone in the bleach solution for about 3 hours. Shake the stone slightly before removing it to make sure any large pieces of debris are shaken loose. Next, thoroughly rinse the stone under the faucet. You can use a soft bristled toothbrush to clean the surface, too. Use warm water and rinse until you can be sure that all of the bleach has been rinsed away. Allow the stone a good 2 to 3 hours to dry before placing it back in the tank. There are some other methods you can try, too, especially if you’re not comfortable using bleach. Some people swear by effervescent denture cleaners, which contain mild bleach, sodium bicarbonate, and citric acid. The bleach disinfects, the sodium bicarb alkalizes the water to clean, and the citric acid removes stains. Plus, the bubbling action caused by the chemical reaction helps loosen any bacteria or other debris stuck inside the stone. You can also stick to good, old-fashioned elbow grease if you’d rather not use any other additives. Just run the stone underwater and scrub with a hard bristle brush. Eventually, you’ll notice your air stone will start to lose its effect even after a good scrub. When you reach this point, it’s time to replace the stone. This is one case when it helps to have a multi-pack. You’ll already have a new one on hand and ready to go. Air stones can do a lot for an aquarium. The constant stream of bubbles adds an interesting look to any aquarium but they do a lot more than just make your aquarium look good. The bubbles look cool also serve an important function by helping to circulate water from the bottom of the tank that otherwise might not make it to the filter. Plus, the added surface area allows for a quicker release of carbon dioxide and absorption of oxygen. Pawfly is a great brand and they make a lot of awesome aquarium equipment, including air stones. When it comes to the best air stones, their cylinder bubble diffuser stones are at the top of our list. Pawfly use high-quality materials that are non-toxic and completely safe for your aquarium. These stones produce a nice sized stream of small bubbles that are a welcome addition to your fish tank. You get 10 of them in a pack so, when the time comes for a replacement, you have plenty of backups to spare. I recently ordered an 8″ PAWFLY air stone from Amazon. The box that arrived is labled ZHONGLE ASC-666. Only marking on the box to say Pawfly is a skew barcode applied by the seller. Nothing saying ASC200. Wondering if they are selling knock off products from China. Will give it a try and see how it works. Anyone know anything about ZHONGLE products?